Ace: a fighter pilot who has shot down five or more enemy aircraft in combat. The Luftwaffe had so many Aces that the number runs into the thousands. The list includes many whose impressive tallies will never be surpassed, names that are recorded for posterity: men such as top- scorer Erich Hartmann with 352 victories, Gerhard Barkhorn who also surpassed the 300 victory mark and Günther Rall, who surely would have done so but for injury. Along with others such as Erich Rudorffer who flew over 1,000 combat missions and was shot down sixteen times whilst achieving his tally of 222 victories; he somehow managed to survive but many didn’t. Unlike their RAF and US counterparts, the highly-skilled and battle-honed Luftwaffe ‘experten’ were not rested from combat to recuperate and hand their knowledge on to a new generation, before returning to the fray. They fought until the end; there was no respite unless you were wounded, shot down and taken prisoner – or killed in action; which many were. Men such as Major Helmut Wick who, had he lived, might have surpassed them all. A successful veteran of the Battle of France, he fought with distinction in the Battle of Britain and was only the fourth recipient of the Knight’s Cross with Oak Leaves. He was the youngest Major in the Luftwaffe when he was appointed Geschwaderkommodore of JG2 ‘Richthofen’, again the youngest ever to hold this position. But, like so many others, his exceptional career and meteoric rise would come to an end. On 28 November 1940 his luck ran out when, with a staggering 56 air combat victories to his credit - at the time, the top-scoring Luftwaffe pilot ever - he was shot down and killed by the RAF Ace John Dundas, during an engagement over the English Channel. Dundas was himself immediately shot down and killed. Helmut Wick is the subject of Robert Taylor’s brilliantly composed Crack Ace, the latest release in his increasingly collectible series of Masterwork drawings. 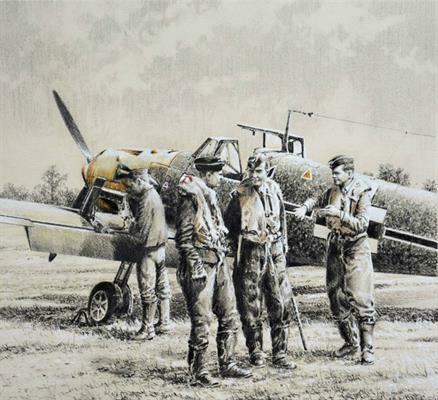 With his unrivalled skill using his striking graphite and paint combination, Robert portrays the top Ace shortly after his appointment as Geschwaderkommodore of JG2 ‘Richthofen’, describing the outcome of a recent duel with a Spitfire to his fellow officers. Following countless Luftwaffe editions that have been produced over more than four decades, the Military Gallery is proud to announce that each print is personally autographed by a prominent Luftwaffe fighter pilot who flew in combat during WWII. Some editions are also conservation matted to include the original autographs of renowned Luftwaffe fighter Aces, giving collectors the opportunity to secure a piece of history for future generations. THE BOOK To complete the portfolio, each print is issued with a matching-numbered, hard-back copy of the book ARRIVAL OF EAGLES by distinguished author and historian Andy Saunders. Approx matted size: 22" wide x 24¼ high"